_ Charles Turner Morris, 88, of Weatherford passed away Saturday morning, Oct. 9, 2010, after a brief stay in a local nursing home. Funeral: 10 a.m. Tuesday at Galbreaith-Pickard Funeral Home with his eldest son, Col. Charles Richard Morris, officiating. Interment: Clark Cemetery in the Friendship community. Visitation: 6 to 8 p.m. Monday at Galbreaith-Pickard Funeral Chapel. Memorials: The family asks that, in lieu of flowers, you donate to a charity of your choice. 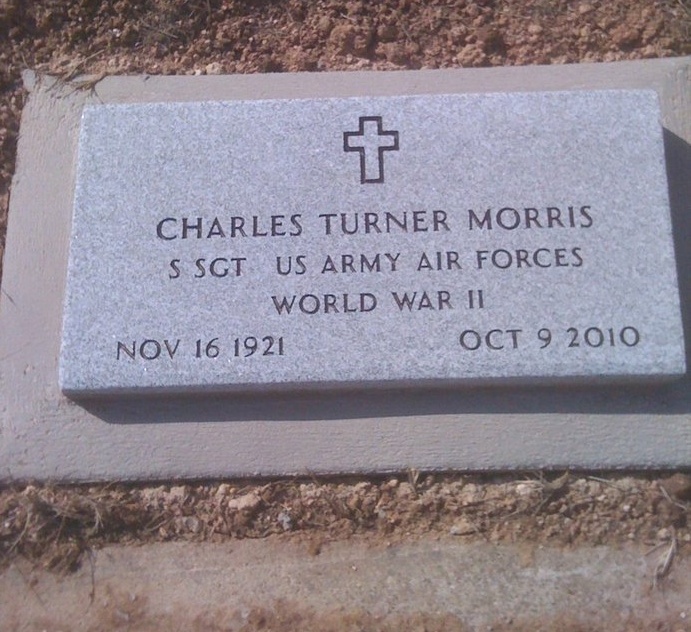 Charles was born Nov. 16, 1921, in Peaster, just outside Weatherford. 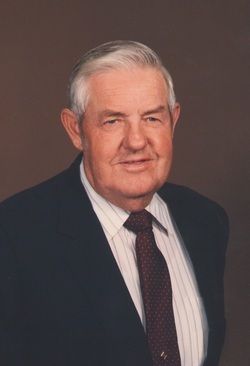 He graduated from Weatherford High School in 1938 and was a lifetime resident of Parker County. He was a member of South Main Church of Christ. He was the last surviving member of 11 brothers and sisters of the C.V. Morris family. Charles joined the Army Air Corps in March 1942 after the attack on Pearl Harbor. He achieved the rank of staff sergeant. He always wanted to fly but could not pass the eye test to allow him to proceed to flight school after trying twice. He was sent to armament school and became a member of the newly formed 418th Night Fighter Squadron that trained in Orlando, Fla., before being sent to the Pacific theater. He was overseas for two years beginning Oct. 6, 1943, starting on the East end of New Guinea proceeding across that country through the Philippines where his squadron supply ship was hit and sunk by a Japanese kamikaze in Mindoro Bay December 1944. He and his fellow airmen survived the attack, proceeded to the Philippines then to Okinawa where he returned to the United States. While on Okinawa he saw the white Japanese aircraft carrying the Japanese officials heading to the signing of the surrender in the Philippines, which ended the hostilities in the Pacific for World War II. 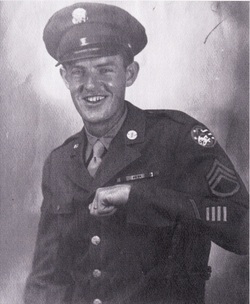 He was honorably discharged on Oct. 5, 1945, after three years and seven months service and returned to Weatherford to his wife and son. When Charles came back from his tour of duty, he went back to the job he left at Montgomery Ward where he worked until taking the civil service test and becoming a postman in 1948. He worked for the Weatherford Post Office as a city carrier briefly then as a rural mail carrier for the rest of his 36 years. He retired in October 1984 at the age of 64 and got his real estate license and sold real estate for approximately two years with his wife at Duncan Real Estate. He returned to the mail business in 1986 by taking a contract rural route in the area of his boyhood home area of Peaster and Poolville. He performed that duty for another 15 years until his final retirement at age 80 in December 2001. Charles was an avid outdoorsman. He spent 30 years hunting big game in Colorado each fall as well as hunting quail, fishing, playing golf and was the consummate vegetable gardener. He was also very active in the Parker County Sportsman Club during the 1960s and 70s where he served as president for one of those years. He loved to play golf with his friends at Live Oak Country Club each day at 12:30 p.m. after carrying the mail to Peaster and Poolville each morning. Survivors: Charles is survived by the love of his life, Jean McAnally Morris, wife of 68 years; children, Col. Charles Richard Morris and wife, Doris McDonald Morris, of San Antonio, Jennifer Morris Lewallen and husband, Milton Lewallen, of Weatherford and Vaughan Morris and wife, Margaret Kirk Morris, of Willow Park; brother-in-law, Marshall Hart of Weatherford; niece, Betty Wells of Mineral Wells; brother-in-law, Charles McAnally and wife, Nell, of Weatherford; four grandchildren; and seven great-grandchildren.